I had a little chat with the members of the Rainmakers sometime in March 2001 for an election-related assignment. The group, who popularized the ballad “Binibini” in the 70’s, was active in doing (writing and performing) political campaign jingles then. “While the time is not right for making a comeback, there should be something to keep busy at,” Luke said in an interview. The Rainmakers. From left, Joel Macanaya, Luke Gaston, *Courier reporter, Joseph Lansang. Mon Villanueva was not present during the interview. Picture taken at their studio. The Rainmakers is the voice and brains behind the campaign jingles of several known politicians including that of showbiz couple (former Senator) Bong Revilla and (Mayor) Lani Mercado. Courier: Does it always follow that jingles should suit the personality of candidate? Luke Gaston: Sa lyrics, andoon na dapat ang power points. For example, iniisip ko gawan ng jingle si Senator Juan Flavier (former DOH Secretary). It would a comedy approach, the tune would be something funny and witty, like the ditty “Pop Goes the Weasel.” It’s funny but it does not necessarily mean that there is no power point. Ang maganda ay ‘yung dumidikit sa mind ng masa. One example is Loren’s (Senator Legarda) campaign jingle, which goes “Loren, Loren, sinta, instead of “leron, leron, sinta.” Very simple, very elementary. If if would be for (Senator) Enrile, dapat medyo dignified. Courier: How important are jingles to candidates? Joel Macanaya: You have to capture everything in 30 seconds, you have to convey a message in 30 seconds. In political jingle, we do one adaptation and one original song for the client. The original song or jingle should stick and identify with the candidate. You have the power point, you have the good lyrics, you have the good things to say, but would it stick to the mind of the listener. I think we are successful in terms of conveying what our clients want to express through our songs. Many of our clients have won the election. The secret, maybe, is effectiveness. The jingles, we suggest should be fast or with a little marching tune. People should be able to know the lyrics of the song and easy to memorize. 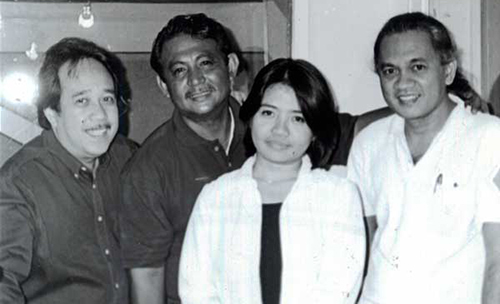 A simple campaign jingle in the early 2000 costs P75,000 for 30 seconds. If it is adaptation P45,000. For a full-length song, P100,000 to P150,000. *I have worked with Courier, the Philippine Journalists Incorporated flagship newspaper in 2000. This article was published in March 3, 2001. This entry was posted in Celebrity, Election, Entertainment, Music, Newpaper, Personal and tagged election, election jingle, newspaper, Reporter's job, the Rainmakers on January 29, 2019 by Yami. Dolphy has always been the cool and understanding Dad in most of his movie or television shows. Who can forget the puruntong-clad John in John and Marsha or Kevin Cosme in Home Along da Riles? Whenever a sticky situation arises the level-headed John or Kevin has always had the solution to address the problem. And I don’t remember watching him puff a cigar from the Famous Smoke Shop in front of his kids, have you? John or Kevin may have been the penniless Dad most of the time, but he always had the admiration and love of his children as he taught them to be good individuals no matter what situation they’re in. This entry was posted in Entertainment and tagged Dolphy, dolphy quizon, home along da riles, john, john en marsha, kevin cosme on July 11, 2012 by Yami. Dolphy’s wake is expected to draw thousands of fans today or whenever the family allows public viewing. The place should be big enough (and might have wet rated outdoor ceiling fans for ventilation) to accommodate the crowd who wish to see the comedy king for the last time. My late grandmom who was a big Dolphy fan would probably be one of those to visit the wake had she been alive today. But Granny would surely be happy to see him in heaven. This entry was posted in Entertainment and tagged Dolphy, dolphy dead, dolphy quizon, dolphy wake, king of comedy, Philippines King of Comedy, pidol, rodolfo dolphy vera quizon on July 11, 2012 by Yami.